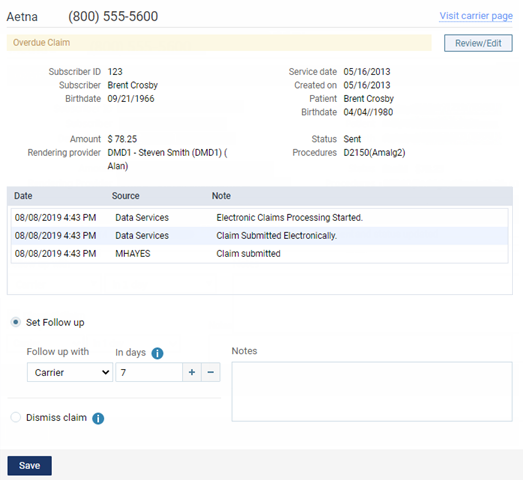 From the practice dashboard, you can manage claims that are overdue. A claim is overdue if it was submitted 15 or more days ago and has one of the following statuses: Sent, Accepted, Pending, Printed, Unprocessable Claim, Additional Information Requested, NEA Error, or Paid (the payment was sent by the carrier but not received by your office). A claim will also be unresolved if it was previously unresolved, a follow-up was done, and then an additional follow-up reminder was applied to the claim. Unresolved claims also include any claim with a status of Rejected (by the payer or clearinghouse). On the Home menu, under Location, click (or tap) Overview. The location's Overview page opens. On a location's Overview page (dashboard), click (or tap) the Unresolved Claims box. This box is available only if your user account has the Billing Coordinator or Administrator role enabled. This box displays the number of overdue insurance claims and a total of the charges for those claims. On the Home menu, under Insurance, click (or tap) Unresolved Claims. The Unresolved Claims page opens. On the list of unresolved claims, leave the first claim selected, or click (or tap) a different claim. Note: The unresolved claims are grouped by insurance plans, which appear as expandable and collapsible sections. You can click (or tap) a plan's button to view the corresponding claims. The claim options become available. Contact the insurance carrier and/or patient. To specify that the claim needs additional follow-up, type any Notes, and specify who to Follow up with (carrier or patient) and when you want to be reminded to follow up. Then, select the Close Claim check box to remove the claim from the list until the specified number of days has elapsed. What do the different claim statuses mean? If the Partial Payment check box is selected for the insurance payment, deselect it. Save the payment. The claim will show that the payment was received.